Even though CEO Steve Jobs will not be playing his customary role, the last Macworld Expo with Apple's participation will still be interesting -- for perhaps that exact reason. Apple's decision to pull Jobs from Tuesday's Macworld keynote speech -- and its announcement that 2009 would be its last year at the show -- deflated much of the usual pre-Macworld speculation regarding the company's 2009 product plans. The show must go on, however; and Senior Vice President of Marketing Phil Schiller will likely have a few new products to show off, such as an iPhone Nano, a revamped 17-inch MacBook Pro, and a new operating system called Snow Leopard. But Macworld 2009 will probably not be remembered for the products introduced there, unless Apple has quite the ace up its sleeve. Instead, Tuesday's 90-minute presentation will be scrutinized for signs that Apple is preparing to change an external communications strategy in which its founder has been its primary spokesman since his return to the company in 1997. It's hard to imagine a fate for Macworld any different than what happened to the East Coast show after Apple cut its ties, however. Since his return to the company, Jobs has always been Apple's primary voice, and whether it was held in Boston, New York, or San Francisco, the star attraction at Macworld. Click here for more Macworld Expo coverage from CNET News. Even though he's not giving the keynote, Jobs will still attract that sort of attention Tuesday, even if all he does is settle into a front-row seat to watch the presentation. Apple has not said whether or not Jobs will make an appearance during the keynote, but such an appearance could go a long way toward deflecting the latest round of rumors surrounding his health. After all, the man is a legend. Arguably one of the most influential businesspeople of the last 30 years, Jobs personifies much of what people like to see in Apple, and much of the brand promise of the Mac: a brilliant iconoclast who takes no prisoners yet cares deeply about elegance. There are signs, however, that Apple is entering a new era. It seems pretty clear that Apple chafed at the idea of having to introduce some of its best new products a few weeks after the close of the holiday selling season. Most consumer electronics companies like to make their big product introductions toward the end of the year, rather than the beginning, but the timing of Macworld forced Apple into a different schedule. Also, while it's not unusual for Jobs to share the spotlight during his keynotes, Apple put together its deepest ensemble cast in recent memory for October's MacBook event. Jobs rolled out the company's latest notebooks accompanied by COO Tim Cook, Senior Vice President for Industrial Design Jonny Ive, and a video featuring executives off the radar of most Apple watchers, such as Vice President of Product Design Dan Riccio. If anything, that event proved that few Apple executives--to be fair, few executives anywhere--have the stage presence and presentation skills that Jobs enjoys. So why would Apple change that role now, when the company is at the top of its game? For one thing, there's a downside to Apple's strategy of putting its founder front-and-center before the public. Rumors regarding his health and appearance have played havoc with Apple's stock throughout 2008 and as recently as last week. Much of that speculation was unwarranted earlier in the year, but given that even up until mid-December Apple had led IDG to believe Jobs would be taking his usual place in Moscone Center, Apple practically invited this round of rumors about Jobs' health by announcing the decision as suddenly as it did. 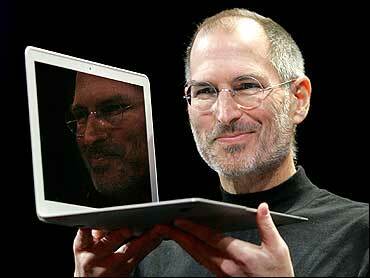 But even if Jobs is merely sick of Macworld, rather than actually sick, Apple will live longer than he will. To be clear, just because Jobs isn't giving the Macworld keynote does not necessarily mean that Apple is ready to lower his profile. The company hosts several of its own events every year, such as the June Worldwide Developers Conference and September music event, and may be planning for business-as-usual Stevenotes at those events later this year. Apple never seems to break up amicably with its partners, and Jobs' vanishing act from Macworld 2009 could just be a parting shot in an often-contentious relationship between Apple and IDG World Expo. Still, at some point Apple will run into problems if Jobs is forever seen as the only person capable of running the company. Apple today is a much different company than the struggling corporation Jobs took over in 1997. It has 32,000 employees, three hit products that generate profits, and the world's largest music store. Apple has sold the concept of Jobs as the single-most important factor in Apple's success so well that many outsiders don't understand that other brilliant, driven people at Apple come up with cool ideas from time to time. Steve Jobs is certainly more hands-on than the average tech executive when it comes to product design and execution, but he's not the only person capable of running Apple. As the saying goes, the graveyards are full of indispensable men. Some day, Steve Jobs will decide he's ready for the next chapter of his life and Apple will need to have a replacement ready. Many have criticized Apple over the past year for seeming to lack a succession plan, but not discussing such a plan publicly and not discussing such a plan internally are two very different things. Tuesday could be the first step in that plan. Phil Schiller is probably not going to be the man who leads Apple once Jobs moves on, but he might be the ideal person to guest-host Macworld as a parade of Apple executives hone their presentation skills and introduce themselves to the general public. For all the accolades deservedly paid to Jobs' leadership and salesmanship skills, there is someone else out there who is capable of keeping Apple on track. Jobs has always struck me as a man with meticulous plans for the future, and it might soon be time for a little light to be shed on Apple 4.0.